Aquatic Development Group in Cohoes plays with slides and chutes to construct destinations like Great Escape Lodge and the Kartrite Resort. It takes a village to build a water park. Ok, so that may not be exactly how the saying goes, but it’s not far off the mark for Aquatic Development Group. As the Cohoes-based company can readily attest, developing water parks that span acres and feature sky-high slides isn’t exactly a one-person job. A team effort through and through, the construction process from start to finish often lasts months and requires dozens of skilled professionals to ensure everything is just right. 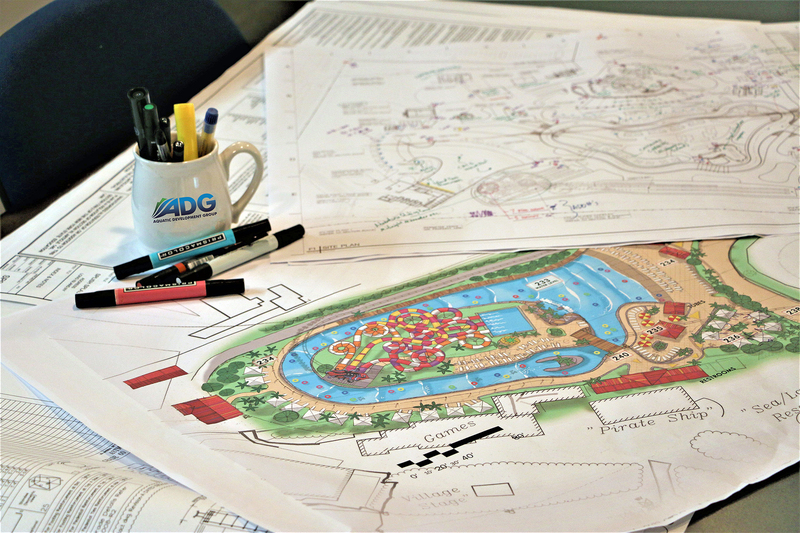 To learn how exactly one goes about creating a water park, we caught up with Aquatic Development Group (ADG), the development company behind some of the most iconic water parks in the world. Thanks to ADG, larger-than-life projects like the Great Escape Lodge and Great Escape’s Splashwater Kingdom in Queensbury and Aqua Planet in the Philippines provide endless entertainment for families across the United States. And it all begins in the Hudson Valley. Since the 1970s, ADG has carved a covetable niche for itself within the world of amusement park development while maintaining a relatively low-key presence within the Hudson Valley at large. The roots for the business began back in the 1950s, when ADG founder and Capital Region native Herb Ellis took a part-time job as a salesman for Paddock Pools during one fateful summer. He didn’t know it at the time, but his side project would eventually take him on a steady ascent up the pool industry career ladder. Fast-forward to the 1960s when Ellis stepped into the role of CEO of Paddock Pools, bringing with him a drive to expand the brand’s reputation to the national tier. He did just that, eventually pushing the Albany-based company to such a scale that it required a rebranding to what is now Aquatic Development Group in the 1970s. At that same time, Ellis also refocused company services from commercial pool building to water park design, development, and construction. Under his leadership, ADG pushed out innovative technologies like the Wavetek® wave generation, which, according to ADG, now powers over 90-percent of recreational wave systems (think: wave pools, lazy rivers, and water rides) in the United States. Not just limited to amusement destinations, the tech also drives aquarium and zoo exhibits and even moves the powerful scenes in flicks like Life of Pi and The Guardian. “Many innovative ideas developed in the ‘80s through Herb’s dedication to ‘doing it right’ are considered standards in today’s water parks,” observes Julie St. Louis, ADG’s marketing and communications specialist. Indeed, Ellis’s commitment to the industry was so impactful that he even became one of the original founding members and Hall of Fame inductees to the World Waterpark Association when it came to life in 1982. As the water park industry began to hit its stride in the 1990s, Ellis handed over the reins to his son, Ken Ellis, who stepped into the role of president and CEO. Around this time, ADG slowly began to offer its InDepthTMApproach, which pairs product development and park design with business development. Thanks to this program, the water park industry flourished into the 21st century, when the new popularity of indoor water parks offered the potential for water-powered amusements all year long. In recent years, ADG has continued to lead the way with innovations like FlowRider®, a surf simulator, and a new series of water rides powered by its Wavetek® system. To date, the company has built eight of these new rides across the United States. Next up, the Cohoes-based company (it relocated from Albany in the ‘90s) is hard at work to complete development on the much-anticipated Kartrite Resort and Indoor Waterpark in the Catskills. The amusement center, which will be part and parcel of the Resorts World Catskills casino and entertainment center in Monticello, has an estimated soft open date of March 28. Throughout development, ADG has taken a holistic approach to the project, considering the overall experience for visitors at the crux of its design. 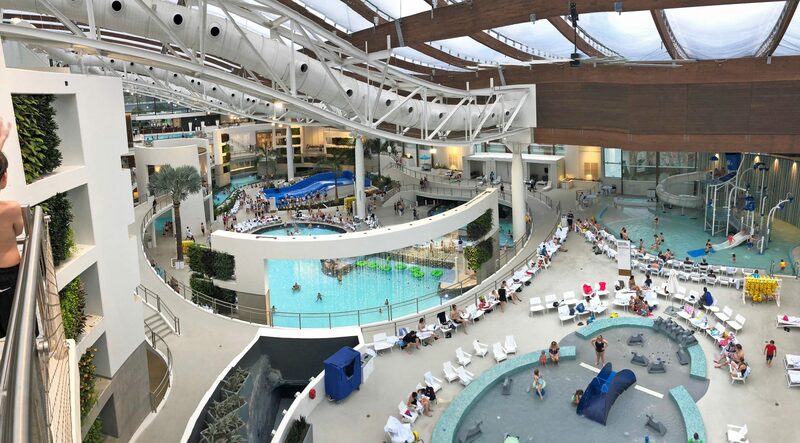 “By taking this holistic design and build approach, ADG was able to bring the vision of an upscale, lush, tropical water park experience to life by incorporating copious amounts of vegetation, themed attractions, and a barrel-shaped Texlon® transparent roof,” St. Louis reveals. While the Kartrite is the timeliest project on the horizon for ADG, it is certainly not the only development on the company’s plate. Across the country, the brand continues to chip away at Gaylord Opryland site in Nashville, TN (May 2019), the Island H2O Live! park at the Margaritaville Resort in Kissimmee, FL, and the H20BX Waterpark in Powell’s Point, NC. Despite the varying scopes of the buildouts, St. Louis notes that, following the design, approval process, and ground-breaking stages, they generally take four to six months to complete, staffing and weather permitting. Still intrigued about ADG’s work in the Hudson Valley and beyond? Take a peek at its website for the full rundown of its past and current projects, then mark your calendar for early April, when the Kartrite is up in action in Monticello. See you on the slides!